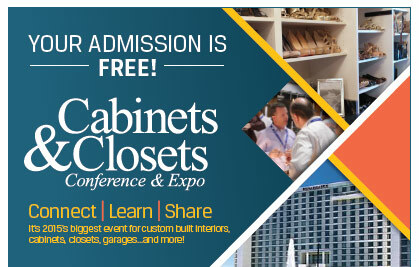 You have made an investment by choosing to exhibit at 2015 Cabinets & Closets Expo and we want it to be successful for your business. 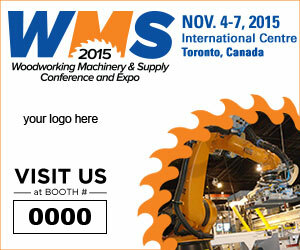 To make the most of your investment, the industry needs to know you will be at the show. We created this toolkit to make it easy for you to tell customers, vendors, media and business prospects that you will be exhibiting at the show. More people at the show means more business at your booth, it’s that simple. 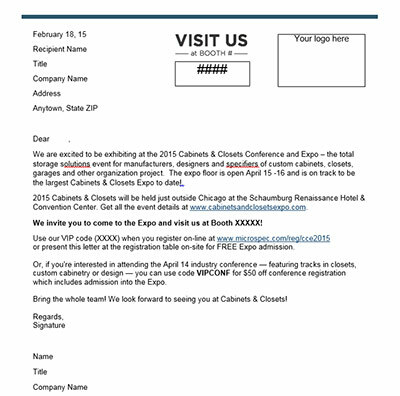 Use the ToolKit to invite your guests to the expo for FREE! Simply open the re-writable PDF files in the toolkit and insert your VIP code onto the toolkit pieces. Your VIP code is what your guests will use to register on-line for the event. Woodworking Network is also offering your VIPs a $50 discount (reg. 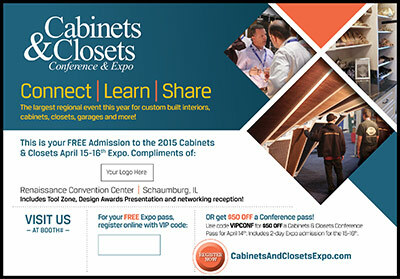 $350) on a Cabinets & Closets conference pass. The pass includes the April 14 all all-day industry conference-- sessions in closets, custom cabinetry and design tracks – and April 15-16 Expo floor admission. Your business will earn one raffle ticket for every 10 conference or expo badges picked up at the event. A raffle will be held for a Woodworking Network custom e-mail (min. $3,000 value) blast to use before December 31, 2015. What’s in the Marketing Toolkit? 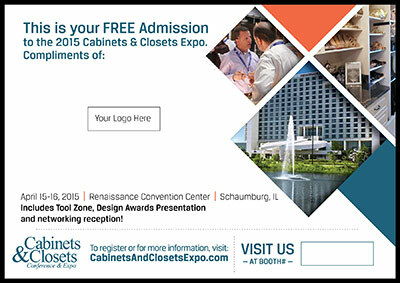 Please contact Carroll Henning, chenning@vancepublishing.com, (847) 415-8024, if you need any additional information about using pieces of the Cabinets & Closets marketing toolkit. Download the toolkit elements you want to ues in the file formats that work best for you. Add your contact information, booth number and VIP code to make the piece specific to your company, and you are ready to go!